When it comes to choosing the most beautiful, enchanting or dramatic waterfalls in Iceland, we really are spoiled for choice. This unique landscape plays host to many hundreds of waterfalls, each with its own distinctive character that is something special to behold. So, where to start? Allow us to introduce you to some of our favourite and most popular falls. 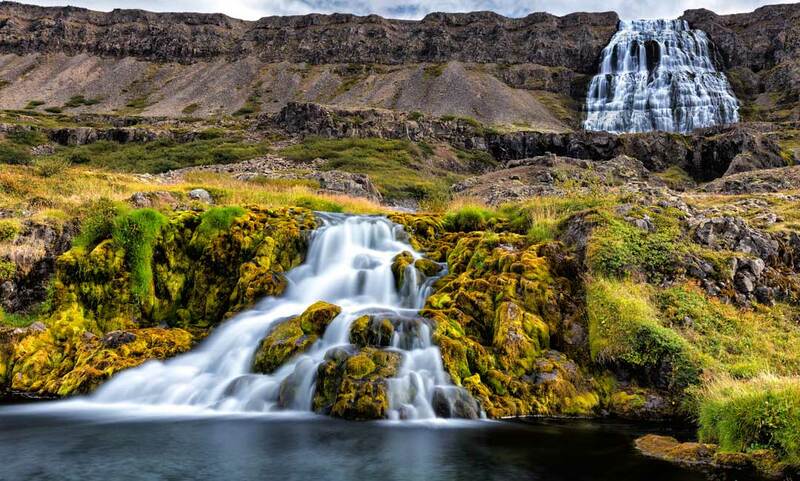 From monumental plummets and thundering majesty to ethereal beauty and simplicity, this selection gives you just a taste of Iceland’s rich and plentiful supply of some of the world’s most unforgettable waterfalls. They truly have to be experienced to be believed. Located in the south of Iceland, not far from Reykjavik, Seljalandsfoss is one of the most visited (and photographed!) waterfalls in the country. 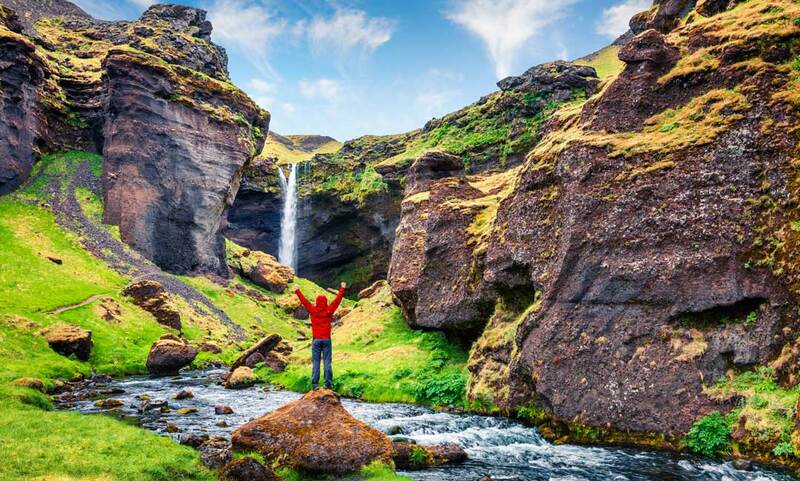 Originating from the volcanic glacier Eyjafjallajökull, the relatively narrow but powerful torrent cascades from a height of 60 metres, making for a breathtaking sight. In summer, you can take an exhilarating walk along a path behind and around the falls to experience its intensity up close. Just be prepared to get a little spray on you! 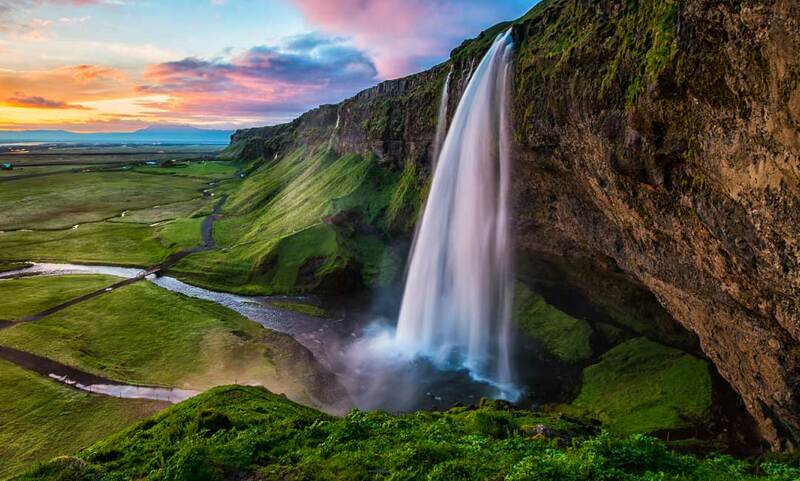 Skógafoss is one of Iceland’s largest waterfalls, at 60 metres high and 25 metres wide. You can walk as close to the falls as you dare, feeling its pounding energy as it thunders from the cliffs above. On a sunny day, you have a very strong chance of seeing a vivid rainbow, framing the falls as the perfect finishing touch. If you’re really lucky, you might even stumble upon the legendary treasure chest that is said to be hidden behind the waterfall! 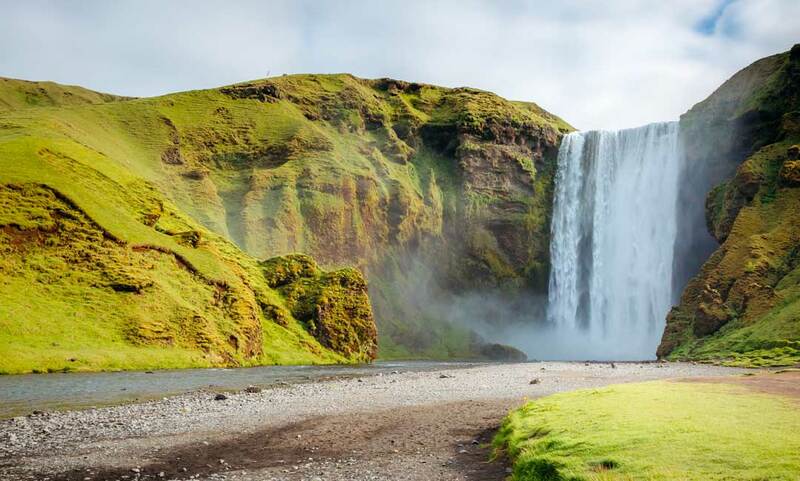 You can also take the 527 steps up to the top of the hill, overlooking Skógafoss and the beginning of a popular hiking trail called Fimmvörðuháls, for a whole new perspective on this epic natural wonder. 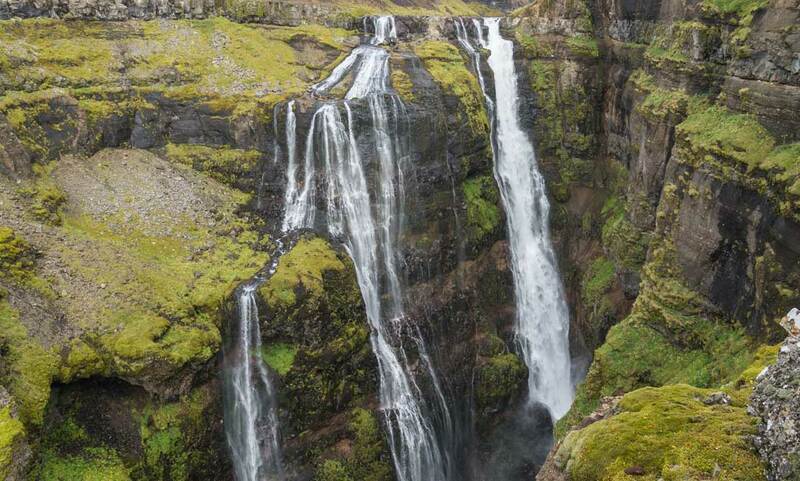 Although it is still very close to the main Ring Road, just to the east of Skógafoss, Kvernufoss is often overlooked as it is slightly hidden away within a gorge and requires a short and gentle hike. For those who seek it out, though, this secluded beauty is a rich reward. In the depths of the gorge, a dramatic column of water plunges about 30 metres, and walking behind it gives you a real appreciation for its invigorating force. In fact, this offers one of the best views of these falls, looking out through the mists and spray as the gorge opens up into a sweeping landscape. Fed by the Hvítá River, which flows from Iceland’s second largest glacier called Langjökull, Gullfoss is a majestic force of nature. One of the country’s most iconic waterfalls, it is actually made up of two stages as the water plummets 11 metres and then 21 metres into a vast, furrowed canyon with walls up to 70 metres high. 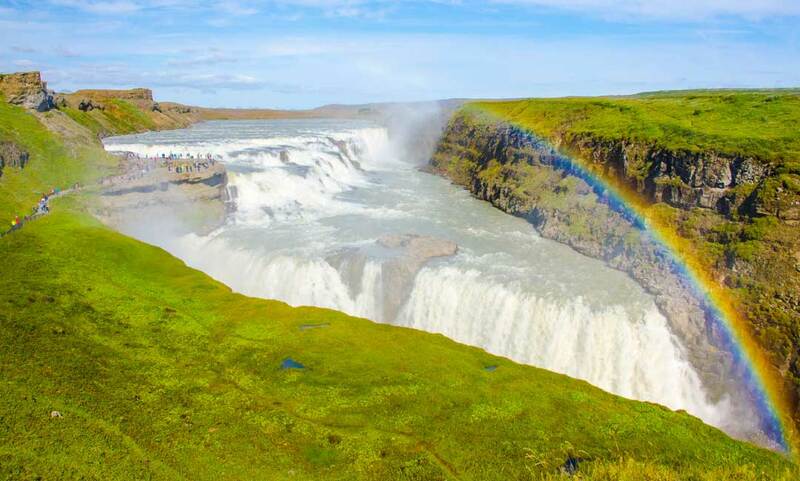 Thanks to its awesome energy, Gullfoss has a history of attracting the attention of foreign investors for its potential in generating electricity, but since 1979 the area has been protected so that locals and visitors can enjoy the raw, untouched power of nature. 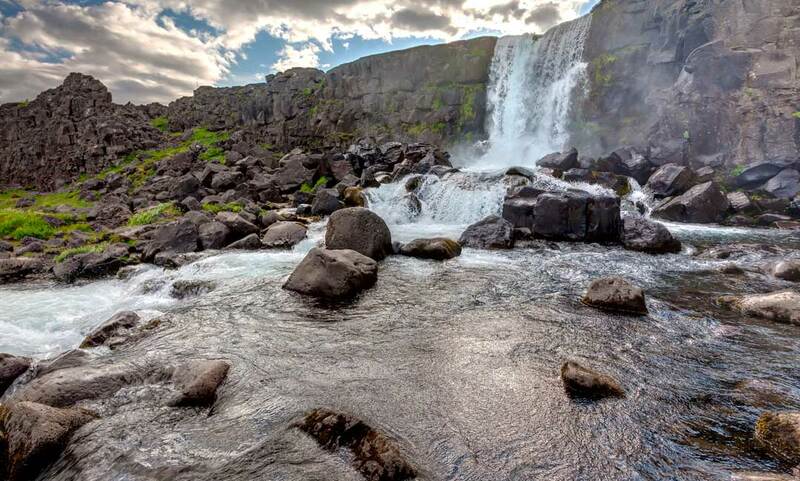 Found in the Þingvellir National Park, the waters of Öxarárfoss cascade over a 20 metre drop into the Almannagjá gorge. 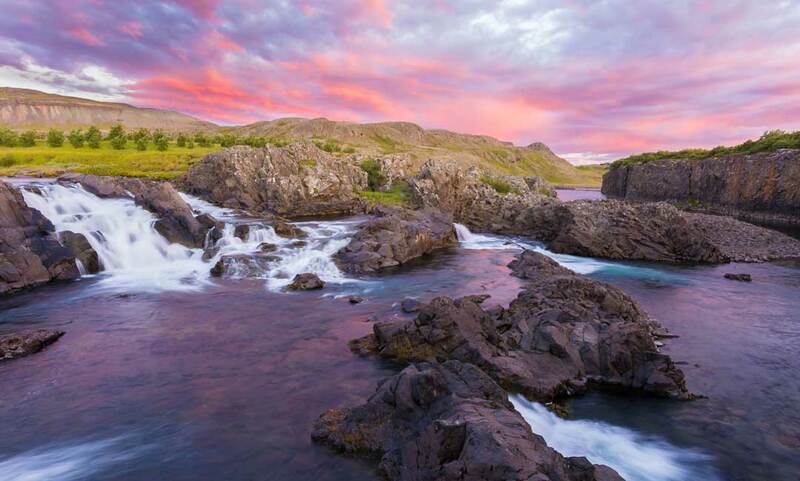 Þingvellir is on the boundary between tectonic plates, which explains its abundance of stunning geological features, ravines and lava fields, and also holds a significant place in Icelandic history. In fact, it appears that Öxarárfoss was at least partly constructed by human hands in the 9th century to direct water into the Almannagjá ravine as a source for the Icelandic parliament at the time. Although this is not one of the largest falls in the country, it is well-known and well-loved. With an impressive plunge of 198 metres, this is Iceland’s second tallest waterfall and is a grand and awe-inspiring sight. The falls are reached by a scenic but challenging hike, but don’t let this put you off as it only helps to build anticipation for the main event! As Glymur is situated in the Botnsdalur valley, within the spectacular Hvalfjörður, the hike is rewarding at every turn and the final vista is well worth the effort. Adrenaline junkies will particularly enjoy wading across the river just metres from the drop, as the water rushes underfoot to cascade over the edge. 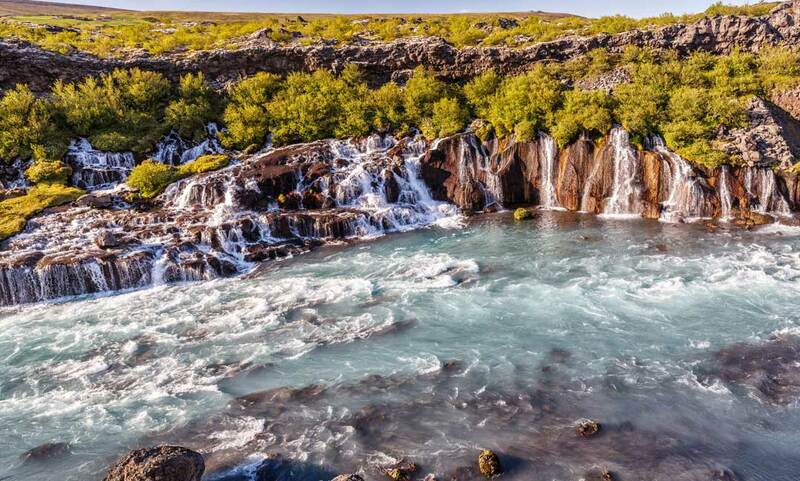 Translated as “lava falls”, Hraunfossar is an extraordinary natural wonder and a waterfall like no other! A cold spring runs through the ground before tumbling into the Hvita River, giving the illusion of water mysteriously oozing out of the mossy lava field, as if from nowhere. Depending on the season, it can look like endless creeks and rivulets or a striking wall of water. The clear spring gives the pool its distinctive and vivid turquoise colour that illuminates the surrounding landscape and feels almost ethereal. Awesome and majestic, Dynjandi earns its place as the jewel in the crown of the Westfjords. 60 metres across at its widest point, the water cascades down various steps like the flowing lace of a bridal veil. But don’t be fooled by its elegance – Dynjandi, meaning “thunderous”, really does live up to its name! As you make your way up the rocky path to this point, passing six smaller waterfalls along the way, the roar of the plunging water gets louder with every step. The understated yet beautiful Glanni falls are found along the Norðurá River, one of Iceland’s most lucrative spots for salmon fishing, so be on the lookout for jumping fish amidst the falling waters. Instead of one waterfall, Glanni consists of multiple cascades on various levels, so that the water is constantly tumbling and churning. Glanni, meaning “light” or “shining”, is so-called because of the bright white of the breaking water on the rocks. The slightly mystical feel of these unusual falls has led to a local legend that you might even encounter elves and trolls around the rolling waters. 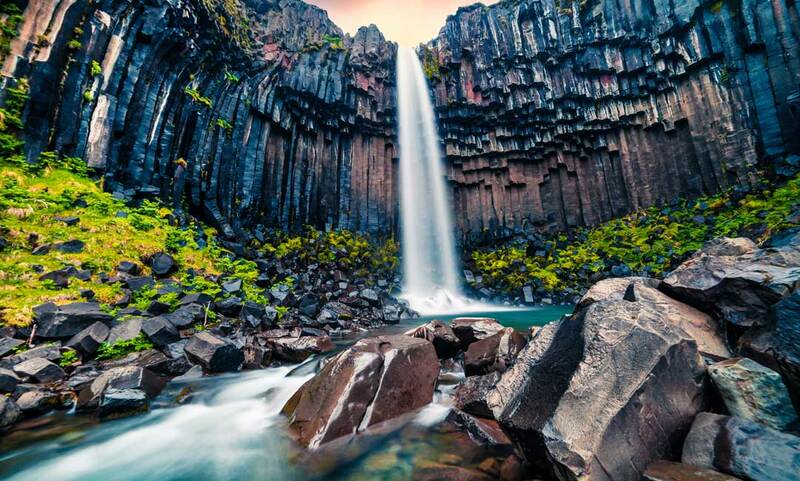 Svartifoss, meaning “black falls”, takes its name from the dark basalt columns that flank the cliff like the pipes of an organ, while meltwater from the Svinafellsjokull glacier cascades over a 20 metre drop. These fascinating hexagonal lava formations make for a profoundly striking backdrop, and have even inspired some of Iceland’s most prominent architecture, including the National Theatre. A small bridge allows you to get closer to the elegantly narrow cascade. Let us take care of you from the moment you arrive in Iceland until you depart.